Both medication and exercise is effective with depression. But exercise has the benefit of "being done" by the client: thus increasing self-regulation and agency. (verified by research CBT and Exercise has more long-term effects compared to medication in most cases). If I convince a person to exercise: thus giving external advice which will increase internal resources, are this internal or external solutions? Here is an explanation of the terms. By internal solutions I mean solutions that the individual can apply himself without the help or training of others and without being dependent on external resources. By external solutions I mean solutions that the individual cannot apply without the training or help or resources of others. 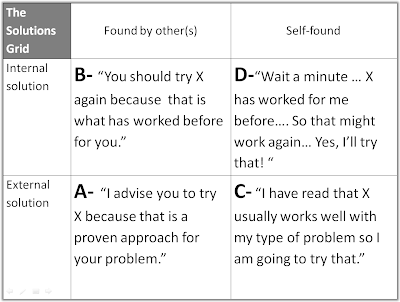 By found by other(s) I mean that the solution is identified and defined by someone else (for instance a coach, therapist, or consultant). By self-found I mean that the solution is identified and defined by the person himself. My hypothesis is that the solutions in quadrant D are the most promising. These self-found internal solutions have some important advantages. The individual trusts these solutions, knows how to apply them, knows they're relevant for him and knows he has the skills required to apply them. Furthermore, he has identified them himself and is most likely to be committed to trying them out. My prediction would be that these D-solutions are most likely to be actually tried out and are most durable, too. What's the link to solution-focused practice? I think solution-focused practice constantly focuses as much as it can by facilitating the person to find internal solutions himself. In other words, it leads to self-found internal solutions. It does this first by acknowledging what the client does as much as possible and by interfering as little as possible with his frame of reference. Solution-focused coaching tries to be as non-obtrusive as possible. Secondly, solution-focused coaching uses activating questions that facilitate the person in his process of finding solutions.